Earth Lodges in the Tropics? Owen: Sorry to disappoint you but this isn’t the best plan for the tropics. It would be vulnerable to water damage and lack sufficient ventilation. It would be uncomfortably stuffy inside from lack of fresh air. You’d have the same problem with domes. Look at my earthbag roundhouse. Houses in the tropics are open and airy for maximum ventilation like our Roundhouse Studio. Note all the windows on every side, the high sloped ceiling, the transom vent over the door, the air gap between the bond beam and roof, and casement windows that capture breezes and pull air into the house. We’ve since added microconcrete roofing tile (MCR) and a vent on top for even better ventilation and durability. It remains comfortable year-round at the same cool temperature. Roundhouses like this would be very hurricane resistant because the wind would just blow around it. There are no flat surfaces for wind pressure to push against. Add strong window shutters to protect windows in hurricane areas. A house like this would be several times easier to build because round shapes are the easiest (no corners, etc.) 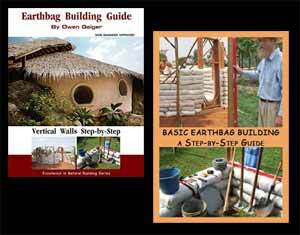 Everything is explained in my earthbag building ebook. In addition, search our blog for previous blog posts on Passive Cooling Strategies that will keep your home cool and comfortable in hot climates at low cost. Would a design very similar to this work in the Florida Panhandle? You’ll face the same issues, so no it’s not the best choice. I suggest a hurricane resistant roundhouse with strong roof tie downs. You can use poly strapping that goes up and over the walls, plus add hurricane resistant truss anchors that are embedded in the concrete bond beam. Face the door away from prevailing winds, limit the size of roof overhang, etc.